The Supreme Court ordered the Sindh government to pay Rs200 million to the Karachi Metropolitan Corporation (KMC) so that the corporation could lift the debris of the constructions razed during the anti-encroachment drive at various locations in the city; however, the provincial government has so far only provided Rs50 million to the KMC. KMC Senior Director Anti-Encroachment Bashir Siddiqi said this while talking to The News on Sunday. He stated that the KMC had to postpone the next phase of the anti-encroachment drive, which it had earlier planned to start in mid-April, because of lack of funds. More than 11,000 illegal structures were demolished during the anti-encroachment drive that began in November last year in the Saddar area on the orders of the apex court. However, the KMC could not lift all the debris of the razed structures on account of the lack of funds. Siddiqi said the KMC still awaits the payment of Rs150 million from the Sindh government so that it could clear the debris scattered on various footpaths, streets and roads. People are demanding of the mayor to lift the debris, he said, lamenting that the mayor and the KMC had no funds to perform the task. Commenting on the postponement of another phase of the anti-encroachment drive, Siddiqi said it was not possible for the KMC to initiate further anti-encroachment operations when the debris of the earlier operations was still not lifted. “It would be a disaster if the KMC kept demolishing illegal structures without having the capacity to lift the rubble,” the KMC officer exclaimed. He added that the KMC would only resume major anti-encroachment operations when it had funds as given the economic condition of the country and the claims of the federal government about the economy, it would not be very wise to assume that the corporation would get funds somehow. According to Siddiqi, the debris to be lifted included bricks, steel structures and sheets, iron rods, concrete blocks, cabins and extended sheds. Sindh Local Government Minister Saeed Ghani was not available to comment on the issue of Rs150 million to be paid by the provincial government to the KMC. 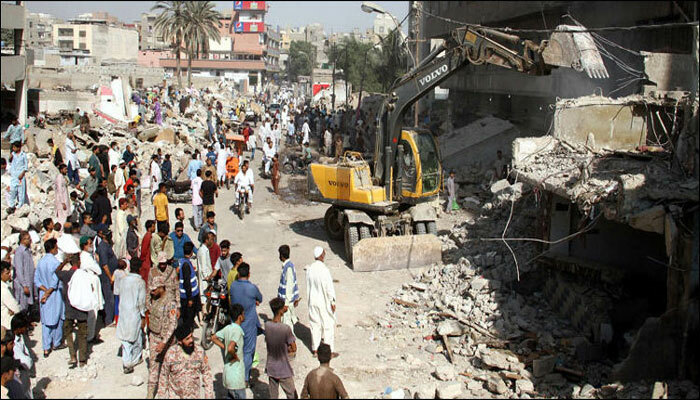 Siddiqi maintained that in the earlier anti-encroachment operations, some 3,000 shops were demolished that were legal tenants of the KMC and paid rent regularly to the corporation. Their shopkeepers were promised by both Karachi Mayor Wasim Akhtar and Ghani that they would be provided shops but so far only 1,500 of them had been provided alternative shops, the KMC officer explained. He said the mayor had identified a vacant plot opposite the Parking Plaza in Saddar where he intended to provide alternative shops to the displaced shopkeepers. However, the plot was occupied by roadside vendors. When asked about stalls and carts that had been set up again by vendors at the Empress Market, Siddiqi said the KMC would remove them if the judiciary ordered so. The KMC has issued notices to the owners of illegal houses built on a 600-yard belt adjacent to the Hill Park. Siddiqi said 47 illegal houses were identified in the area after which their owners were served notices to remove their illegal structures.